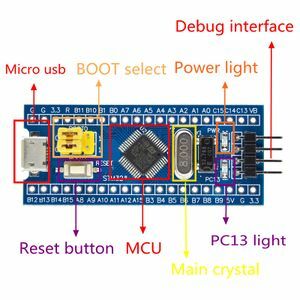 This page is about inexpensive microcontroller boards containing an STM32 processor and how to get them to work. 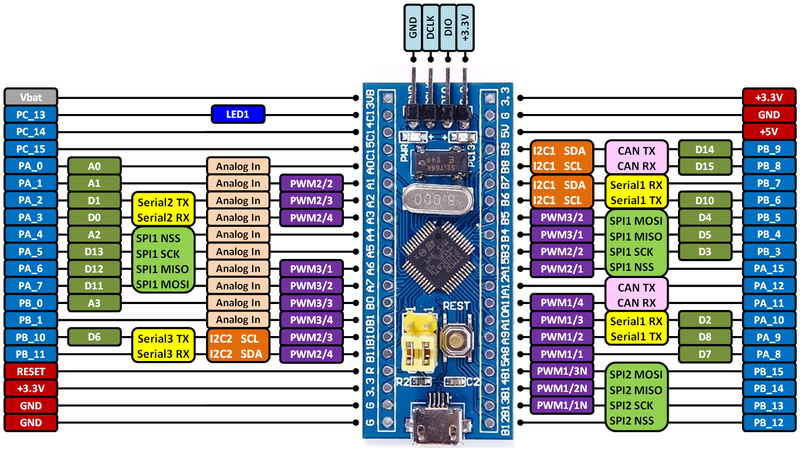 Another, very similar, guide to getting started with STM32 and Arduino. I like the STM32duino bootloader method. This way, you need to wire up a USB/serial conversion board and set/reset jumpers only once for bootloader installation and from that point on you can program the board over USB. This describes the steps I did to get a "blue pill" board to work on Debian Jessie. 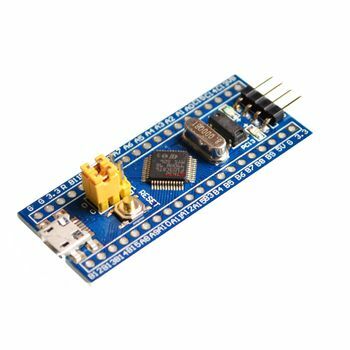 get and install the latest Arduino IDE from here. Platformio allows you to build/upload/monitor Arduino programs without using the Arduino IDE (and more). All settings (which target, which libraries, etc) are stored in a platformio.ini file (instead of existing only as selections in the Arduino IDE). Below is an example platformio configuration for a blue pill with the USB bootloader. Save this to a file named platformio.ini in the directory where the .ino file is. You can build the binary with 'pio run', upload it with 'pio run -t upload' and interact with your sketch over the serial port with 'pio device monitor'. Note: don't use 'bluepill_f103c8' as board, it is not compatible with the stm32duino bootloader! The hardware I'm using, is the blue pill, I soldered on the headers for easy plugging with dupont-wire. The USB bootloader makes it easy/fast to upload new software into the board over USB. You need a USB-serial converter for this. set the BOOT0 jumper to the "1" position and the BOOT1 jumper to the "0" position, then push the reset button. return both BOOT jumpers to the "0" position. in the Arduino IDE, under menu Tools / Board, select "Generic STM32F103C Series"
in the Arduino IDE, under menu Tools / Upload Method, select "STM32duino bootloader"
Actually build something with an STM32!